Processed foods are lining the shelves of our grocery stores. They are in restaurants, schools, fast food chains and most likely in your own home. The day I first learned about the dangers of processed foods is a day I don’t really recall. I just remember standing in my kitchen one night, at midnight, and chucking canned goods out of my cupboards. I felt fearful and freaked out. One thing I have learned is that doing anything out of fear is never the best method. It winds up causing great amounts of stress and can easily spread that stress to those around us. So how do you cut processed foods without the midnight freak out? Check out these 5 must-see tips to help you ease into a cleaner way of eating. *The post contains affiliate links. Although I may make a commission, all recommendations are my own. Starting off, it’s of course important to know why you’re cutting processed foods in the first place. I could write an entire post about this, for now, let me share this great article by Authority Nutrition with you. The basic way I started to think of processed foods is that my body was designed to eat food. Real food, the food that earth designed. The honest truth is that the majority of what we find in supermarkets today may resemble food, but it has been so highly changed and tampered with our bodies don’t even know what it’s eating. It will recognize these types of food as a toxic material. Because that’s what a lot of it is. *Click any of the links to see my top recommended food. I know this may be a surprising thing to read. A lot of times when people set out with good intentions to eat better, they just start grabbing organic labeled foods. This is exactly what I did. Organic crackers, check. Organic cereal, check. While this is a step in the right direction, you will still be consuming a highly processed product. Remember, that’s ok. It’s still a step toward better health. Organic food often means better, more natural ingredients Just remember that if it comes in a box, can or bag, it has been processed in some form. Can’t read it, don’t eat it. When you are looking at processed foods in the store, start taking the time to read the labels. If there is something listed that you can’t pronounce…neither can you body. Maybe you work in a lab and you can pronounce the hardest of words. In that case, think of it this way: If it isn’t something Grandma would have had in one of her recipes, it’s a no-go. Our bodies don’t recognized these man made food additives. Continuing to eat them will eventually lead to disease of some sort. Starting with inflammation. If you struggle with IBS, autoimmune diseases, constipation, or even depression, avoiding these additional food add ons could really be a huge game changer for your system and your health. Start sticking with store bought items that have 5 ingredients or less. If you can recognize all the ingredients, and there are only a few, then you are doing great. These types of foods will most likely be organic or natural. Again, organic is great, the less funky stuff, the better. However, be sure to check just what these 5 ingredients are and what order they appear. The first ingredient will tell you what you’ll be getting the most of. A lot of times the first or second ingredient will be sugar for organic packaged foods. Be sure to keep an eye on that as well because sugar in itself can do its own kind of harm to your body. Easy to remember: the less, the better. After you’ve gotten the hang of checking ingredients, try avoiding the packaging all together, or work your way toward less. If you are in the habit of buying applesauce packets for your kids (I know, these can be a God send) try to buy it in a glass jar. Glass is a better packaging option than plastic and by keeping them out of those tiny tubes, you know your sauce has gone through one less packaging step. Instead of buying snack size trail mix packs, buy a large container or get them fresh. Most likely this will also be the more cost effective way to go. For these types of changes, you will also be cutting down on your carbon footprint by throwing away less garbage. The best place to avoid buying things in a box is to shop the outskirts of the store. The way most grocery stores are set up, all your produce and fresh food options will be on the outskirts, away from shelves. Take steps toward filling your cart with mostly fresh produce, deli meats and cheeses and desserts from the bakery. This is a step you can start right away. Think of some of your favorite packaged meals, take one and try to re-crreate it, or at least something similar. Even just taking the time to re-create your own taco seasoning. Instead of buying pre-packed purgers, buy your own meat, add your own seasonings and form the patties yourself. It’s a few extra steps, but they are really not all that time consuming. If you’ve got kids, take full advantage of this time. Teach them to cook while spending time working with them. They will take so much from these experiences. If you have no idea what you’re doing in the kitchen, pick an easy recipe you can learn together. Start small with this step if you have no idea what you’re doing in the kitchen. Give yourself grace. Choose one meal for the week and pick a day to try it out. Maybe even make enough to last all week? meal prepping can be a huge lifesaver when you’ve got a lot going on. Check out some of the super simple meals I have on my Recipes Page. 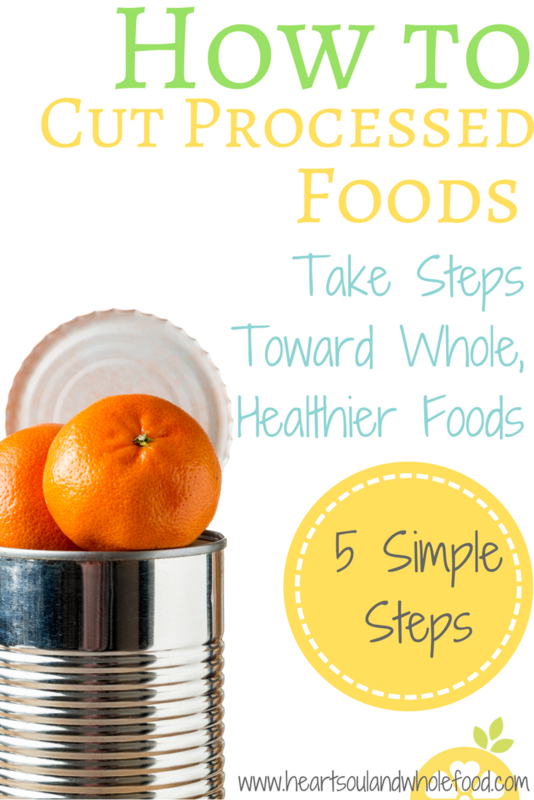 All you can really do when it comes to cutting processed foods is to do your best. Start small but take steps toward bettering your health and your families. Hopefully these 5 simple steps help you a lot more than I helped myself! No, you don’t have to throw out every single item in your cupboards that doesn’t comply with your newly learned information. Maybe just find some healthier options to cook along side them. I have a few other resources below that will be helpful when it comes to strolling through the grocery store. Check them out below.